Assam Jatiya Bidyalay Noonmati Guwahati Jobs 2019 April - Teachers recruitment :- Welcome to North East India's No. 1 Job Portal NeCareer.com . 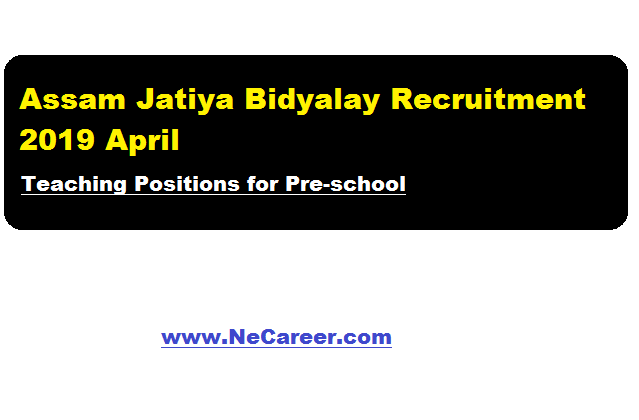 Assam Jatiya Bidyalay Noonmati guwahati invites candidates (Females) for Teacher position for pre-school section. Essential Qualification: Candidates must be graduate with Montessori training and also should have minimum 2 years of teaching experience in Pre-school. Candidates should have Assamese medium schooling background. Interested candidates may collect application form and submit application from 03-04-2019 to 12-04-2019. Interview Date : 19-04-2019 from 01 P.M.